> Industry > The highs and lows of enterprise SEO: Which strategies paid off best in 2017? The highs and lows of enterprise SEO: Which strategies paid off best in 2017? As we come to the end of 2017 and embark on the inevitable dozens of review articles looking back over the past year of search, it’s as good a time as any to reflect on SEO strategy. What are the greatest challenges being faced by the industry as a whole? What have been the biggest successes? What are companies of different sizes setting as their top priorities for SEO strategy – and how well is it paying off? To find out, link-building and content marketing agency North Star Inbound, in partnership with seoClarity and BuzzStream, set out to “take the temperature” of enterprise SEO. They surveyed 240 SEO specialists across the USA from both in-house and agency teams, in a bid to discover how and where enterprise SEO teams are spending their budgets, their most pressing issues, their biggest stumbling blocks, their perception of their own success, and more. The results shed an intriguing light on what different companies consider to be most important about SEO, how they go about tackling those issues, and which SEO tactics pay the greatest dividends – particularly in terms of how these findings vary across businesses of different sizes, and between in-house and agency SEOs. So what were the key findings, and what do they mean for the way that SEO is being carried out in 2017-8? Resources for enterprise SEO: What are they, and where are they going? How much of a company’s budget and workforce typically gets allocated to SEO? And where do enterprise SEO teams primarily focus their time and attention? 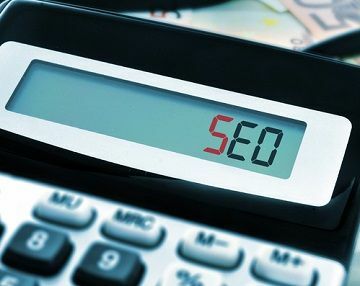 Unsurprisingly, larger companies tend to outspend smaller firms when it comes to SEO, but the study found that companies’ SEO budgets cover the whole range – meaning there is definitely no “magic number” for SEO spend. The good news (at least for SEOs!) is that the most popular budget was also the largest: 27% of respondents reported that they had a monthly budget of more than $20,000 for SEO. Close to a fifth of companies (19%) had between $5,000 and $10,000 to play with, while a very similar percentage (18%) were allocated less than $1,000. Perhaps surprisingly, 11% of large companies (with 500+ employees) fell into this bracket – though of course, it’s not just about what you spend on SEO, but how you spend it. What about people power? The study found that the most common size of SEO team is 2 to 5 members – regardless of the overall size of the company. Two fifths of respondents surveyed (42%) reported working in an SEO team of 2 to 5, while close to a third (32%) had 6 or more people in their team. Nearly a quarter of companies (23%) said that the responsibility for SEO falls on a single person. Regardless of resources, companies seemed to broadly agree on their priorities for SEO. When asked to rank four areas of SEO in order of priority, respondents from companies of all sizes reported that their top priority was technical SEO. Second, third and fourth priorities were – again regardless of company size – content development, traffic analysis, and link building, respectively. But maybe enterprise SEOs should be putting more emphasis on link-building, as survey respondents overwhelmingly described it as the most difficult SEO strategy to execute. Well over half of respondents (58%) ranked it top out of a list of eight, with small companies (with 1-100 employees) feeling the pain most of all. Why is link-building proving such a tough nut to crack? Let’s look at how enterprise SEOs are tackling link-building. Well over half of survey respondents reported that link-building was their most difficult strategy to execute, although there were some noticeable variations by size. 68% of small companies rated link-building as the most challenging part of SEO, followed by 62% of medium-size companies and 42% of large companies. But the difficulties associated with link-building aren’t preventing SEOs from investing in it. 85% of respondents, across all business sizes, reported that they will be maintaining or increasing their link-building budgets this year. 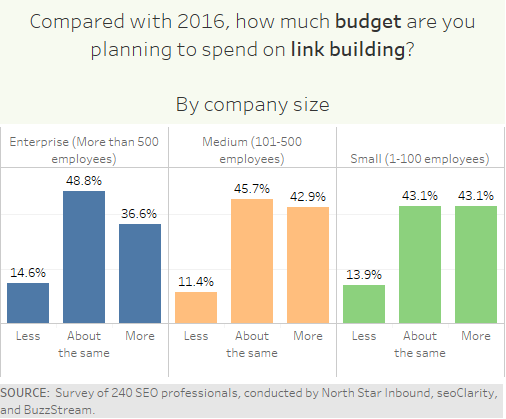 Large companies were most likely to be maintaining their link-building budgets, with 49% reporting they would be keeping their budget for link-building “about the same”, while small companies were most likely to be increasing their budget. Link-building can be done in a huge number of ways, but there were clear frontrunners for the most effective strategies. SEOs from small, medium and large firms all reported that public relations is their most beneficial tactic for link-building, though for small company SEOs, guest posts came a very close second. Other effective strategies included infographics (third-most effective for large companies of 500+ employees), local citations/directories (which came in third for small companies), and resource links (which ranked third for medium-sized companies, joint with local citations). Paid links and comments were universally rated as the least effective strategies by all respondents, though this may also be due to a lack of employing these tactics in the first place – Google penalizes almost all types of paid links, and discourages systematic blog commenting as a method of link-building. Which companies have been seeing the most success with link-building as an SEO strategy? When asked to rate their most successful strategy over the past 12 months, respondents overwhelmingly pointed to technical on-site optimization: 65% of large companies, 67% of medium-sized companies and 53% of smaller firms rated it as their most effective SEO tactic. For small companies, blogging and link-building follow close behind, with 35% of SEOs from small firms reporting success with blogging for SEO, and 33% reporting that link-building was their most successful tactic. This was not so for large companies, for whom link-building ranked a distant 6th out of 7 SEO strategies, with just 14% saying it was their most successful strategy. We know that small firms are more likely to have increased their budgets for link-building in the past year, so perhaps this extra resource towards link-building is making all the difference. But this is something of a chicken-and-egg style conundrum: are small companies allocating more budget towards link-building because it’s successful, or are they successful with link-building because of the extra budget? Small companies are also more likely to be employing local-level link-building tactics such as local directories or citations. Link-building at a local level can be highly effective when carried out correctly, so perhaps this added emphasis on local SEO is making the difference for enterprise SEOs at small firms. Finally, which KPIs are SEOs using to track their success with link-building? The favored metrics are Moz Domain Authority and Page Authority, together with the number of linking root domains (both used by 52% of SEOs). The relevance of the linking page is third-most-used at 47%, while Majestic’s “Trust Flow” metric trails behind on 27%. Agency vs in-house: Who’s winning at SEO? Of the 240 SEO specialists surveyed for the study, two-thirds were in-house SEOs, while the remaining third worked for an agency. What differences in approach and outlook did the survey find between these two groups? When it comes to organizational challenges, agency and in-house SEOs differ slightly on what they consider to be the most pressing issues. Agency SEOs are more likely to encounter challenges with finding SEO talent (44% reported this as their most challenging obstacle) or demonstrating ROI (41%). For in-house SEOs, developing the right content was their most pressing obstacle (reported by 42% of respondents), while demonstrating ROI was again a key challenge, faced by close to two-fifths of in-house SEOs (37%). Agency SEOs were least likely to struggle with allocating the right resources, with only 18% reporting this as a top organizational challenge, while in-house SEOs struggled least with securing budget (21%) but were more likely to encounter challenges in allocating it (31%). But the real differences came in the way that agency and in-house SEOs perceived their own success. Agency SEOs were vastly more likely to be confident about their own success: 40% of agency respondents rated themselves as “Successful – we’re absolutely crushing it” compared with just 13% of in-house SEO teams. However, perhaps in-house SEOs are just modest, as almost half (49%) rated their SEO success as “Positive – we’re doing well enough” (versus 39% of agency SEOs). In-house SEOs were also more likely to report being “frustrated” with their SEO outcomes (the lowest possible rating) than agencies – 8% of them gave their SEO efforts this rating, compared with only 3% of agency respondents. What do the findings from the study tell us about the state of enterprise SEO? While SEO will always depend somewhat on the individual circumstances of an organization, there are some broad conclusions we can draw from the data. SEO as a discipline appears to be well-resourced overall, demonstrating that companies consider SEO a branch of marketing worth investing in. The challenge is therefore more often deciding how and where to allocate those resources, rather than a lack of resources. Technical SEO is a top priority and a top source of success for enterprise SEOs, while companies seem less sure of where they stand with link-building. Many are putting budget into it without necessarily being satisfied with or confident in the results. While some SEO mainstays (like technical on-site SEO) are effective regardless of company size, the effectiveness of SEO strategies often depends on the size of a company, with smaller companies seeing much more success with strategies like blogging than larger organizations. Agency SEOs are much more likely to feel confident in their SEO success than in-house teams, in spite of reported difficulties with securing the right talent for SEO. However, both in-house and agency SEO teams face difficulties with proving the ROI of SEO, showing perhaps that this perceived success can be difficult to translate into hard numbers for the benefit of the higher-ups.